A group of criminals in 1946 pull off the heist of the century, stealing a dozen priceless works of art from a Boston museum. But while the thieves get caught, the art is never found. Forty years later, the last surviving thief gets out of jail and goes hunting for the loot, involving some innocent college students in his dangerous plan - and thirty years after that, in the present day, the former college kids, now all grown up, are drawn back into danger as the still-missing art tempts a deadly new generation of treasure hunters. 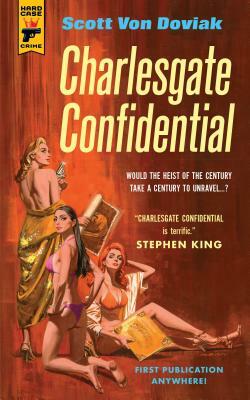 A breathtakingly clever, twist-filled narrative that moves from 1946 to 1988 to 2014 and back again, CHARLESGATE CONFIDENTIAL establishes Scott Von Doviak as a storyteller of the first order, and will leave you guessing until the very last page. Scott Von Doviak is the film critic for the Fort Worth Star-Telegram and has written about movies for the Houston Chronicle and the A.V. Club. He is also the author of three non-fiction books, including HICK FLICKS: THE RISE AND FALL OF REDNECK CINEMA, IF YOU LIKE THE TERMINATOR..., and STEPHEN KING FILMS FAQ. He lives in Texas. “Impressive…inventive…immensely enjoyable.” - Tom Nolan, Wall Street Journal & chosen by Wall Street Journal for "Best of 2018"